Summer has come, and 'tis the season of music festival. Last year, Hikashu performed again at Fuji Rock Festival, the biggest rock festival in Japan. This summer, the band will appear three festivals: Jazz Art Sengawa, Ashigara Mirai Ongaku Festival, and World Happiness. Among them, the last one is the biggest and most accesible from central Tokyo. 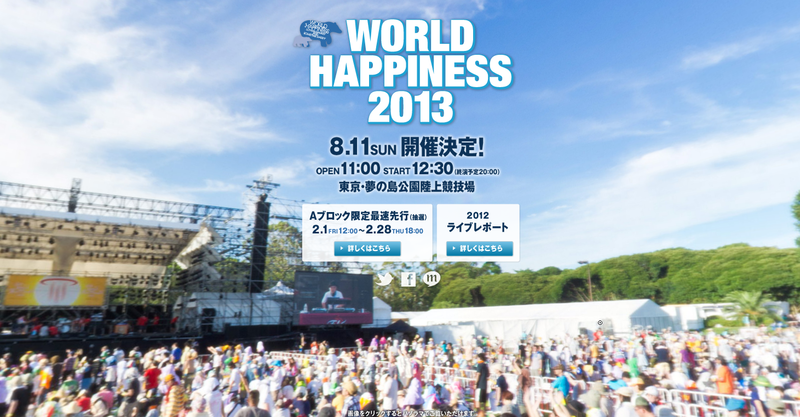 Judging from its artist line-up, World Happiness could be described as a sort of nostalgia event. Most acts are veterans from the seventies and the eighies. Having said that, we cannot help but thinking why Hikashu are chosen. Of course the band has been around 35 years, but they are actual and still continue to evolve. That's quite different. Anyway, there's no doubt that World Happiness is a great event and it's always nice to see Hikashu performing at such a huge, outdoor arena. We still recommend more for Jazz Art Sengawa or Ashigara Mirai Ongaku Festival as musical event, but generally World Happiness offers what you'd have to pay ... Well, actually it depends. The bottom line is that it's a matter of taste. In August, World Happiness (Aug. 11; Tokyo) is a real nostalgia trip for all those bubble-generation hipsters. (...) and those looking for a break from pure nostalgia would do well to check out Hikashu, who, despite their '80s technopop roots, have been constantly evolving throughout their 35-year career. Their current shows are an explosion of eccentric pop, avant-garde jazz, and something indefinable and uniquely theirs that leader Koichi Makigami terms "'pataphysic rock."